Two days ago I wrote about looking forward to being able to spend these final few days of Advent in quiet anticipation. So I was especially struck by the opening words of the homily at yesterday's Mass: that our longing, our anticipation for God is but a pale reflection of God's joyful anticipation and longing for us. It is God who waits with joy and expectant anticipation, God who is most eagerly longing for union, longing to be with us and to share himself and his abundant love with us. And so I found myself reflecting on that word 'anticipation'. We generally use it to refer to eager, expectant waiting - to looking forward to something. But its original, less-used meaning is 'to act in advance'. There's no quiet, still waiting here, though there may be plenty of eagerness in anticipating someone's needs, just as the person who forestalls or anticipates someone's likely action or reaction is wide awake and fully aware. And to a certain extent we 'anticipate' Christmas in our activity because so much of Advent - especially the last few days - is spent in preparations; just as we also anticipate it in our waiting and expectancy. This month we've had one of the warmest, mildest possible Decembers. Yes, we know it's winter: bare-limbed trees stretch out to a sky which is invariably grey, we only have about five hours of proper daylight and parts of the north-west have suffered from heavy rain and flooding, but... ﻿our temperatures speak more of early March and spring, and nature seems somewhat confused. I haven't yet seen any snowdrops or crocuses, but I can see these daffodils, which should normally wait until February to flower, from my window - and behind them there's another clump beginning to emerge. 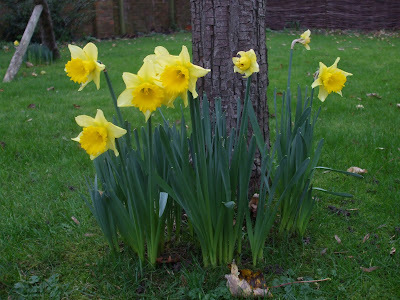 They have certainly anticipated spring - by two months! It's as if they couldn't bear to wait their turn in the usual flowering queue; couldn't bear to wait, sleeping in the earth, for even another day or week. They are lovely, but their golden yet premature presence also reminds me of the fragility of our planet earth in the face of climate change; a fragility we all share. And it is into this fragility that Jesus comes, to share it with us.